Deborah Blum, who blogs at Speakeasy Science, part of the PLoS Blog network, writes about things chemical and toxicological in ways that travel past the brain and straight to the heart. She is author of The Poisoner's Handbook: Murder and the Birth of Forensic Medicine in Jazz Age New York, which features her characteristic graceful chemical descriptions and deep sympathy for the human condition. Her blog is like her book, blending scientific accuracy and storytelling in a way that is hers alone. Whether she is tackling the timely--as in her recent post on what pepper spray really does to you--or the heartbreaking and historical--as she does in her post about the deadly early history of leaded gas--her writing pulls you in and keeps you there, aghast and agog, until the final punctuation mark. The expertise and gravitational pull of her narrative make clear why Blum has won a Pulitzer. She also is a professor of journalism at the University of Wisconsin (lucky, lucky students) and has written several other books. You can read more about her on her Website. It's one of the benefits of the Internet that you also can read her work, as it unfolds, at Speakeasy Science. Any one of her posts will pull you in, but in addition to the above-linked entries, we also suggest--just as a start--her take on Dr. Oz's "arsenic in apple juice" statements and the devastating "Poison in the Night," about carbon monoxide poisoning. For a little lighter fare--and a great cookie recipe just in time for the holidays--check out , "So, 268 chocolate chip cookies later...". Or, you could just start here, at the beginning. Imbibe each and every post as though it were a master class in narrative construction somehow confounded in ways most beautiful with the essentials of chemistry. 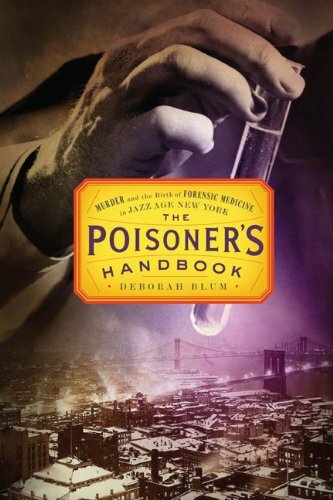 It's a poisonous world out there, and we're glad we've got Deborah Blum to tell us about it. Oh! I'm glad you mentioned this - you remind me that I read a review of Poisoners Handbook and I thought it sounded fascinating. One for the wishlist! It's a great book. One of those that keeps you awake, reading, when you really, really know that you need to go to sleep.